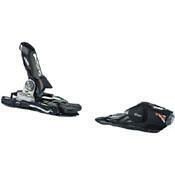 With a DIN range of 3.5-12, this binding is ideal for a wide range of skiers, from intermediate to aggressive experts. 6mm of rise under the toe piece and 6.5mm under the heelpiece add leverage to aid rolling on to an edge, especially when mounted on fat skis. The PX 12's suspended heelpiece provides more lateral support and decreases the amount of energy lost between the boot and the ski. You get improved performance without exerting any extra energy. This binding also has improved elastic travel. Elastic travel delivers shock and vibration absorption while guaranteeing a timely release during a fall. These have a din from 3.5-12. They are durable, light, and hold you in. They are reliable, safe, and predictable so you don't crank up the dins to screw up your knees. They don't have the pivot heel like earlier versions.